Objectives : Direct measurement of skin dose of radiation for children using optically stimulated luminescence (OSL) technology using nanoDot® (Landauer, Glenwood, IL, USA). Background : Radiation dose is estimated as cumulative air kerma (AK) and dosearea product based on standards established for adult size patients. Body size of pediatric patients who undergo cardiac catheterization for congenital heart disease vary widely from newborn to adolescence. Direct, skindose measurement applying OSL technology may eliminate errors in the estimate. 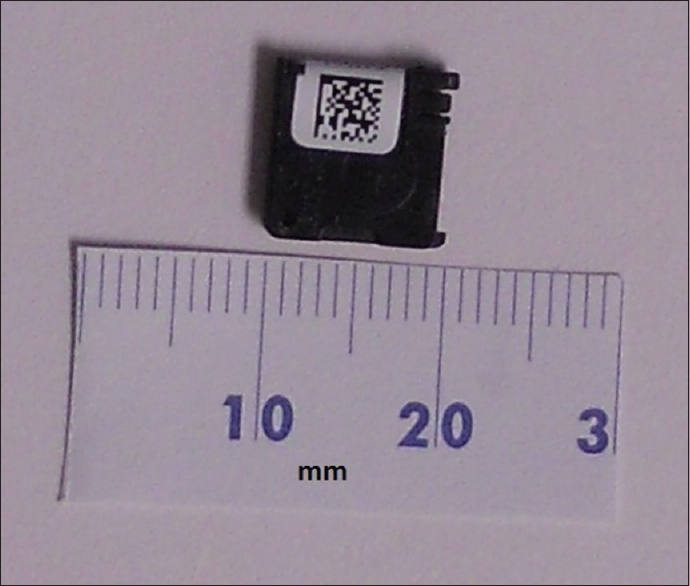 Materials and Methods : The nanoDot® (1 cm × 1 cm × flat plastic cassette) is applied to patient's skin using adhesive tape during cardiac catheterization and radiation skin doses were read within 24 hrs. nanoDot® values were compared to the currently available cumulative AK values estimated and displayed on fluoroscopy monitor. Results : A total of 12 children were studied, aged 4 months to 18 years (median 1.1 years) and weight range 5.3–86 kg (median 8.4 kg). nanoDot® readings ranged from 2.58 mGy to 424.8 mGy (median 84.1 mGy). Cumulative AK ranged from 16.2 mGy to 571.2 mGy (median 171.1 mGy). Linear correlation was noted between nanoDot® values and AK values (R2 = 0.88, R = 0.94). nanoDot® readings were approximately 65% of the estimated cumulative AK estimated using the International Electrotechnical Commission standards. Conclusions : Application of OSL technology using nanoDot® provides an alternative to directly measure fluoroscopic skin dose in children during cardiac catheterization. Our data show that the actual skin dose for children is approximately one-third lower than the AK estimated using international standards for adult size patients. Radiation dose during medical procedures that use X-rays is a concern, especially in children who are at higher risk for developing radiation-induced malignancy., Children with congenital heart disease undergo multiple catheterization procedures and therefore, are prone to have a higher cumulative exposure to radiation in their life time starting from young age. In the recent era, greater attention is paid to the radiation dose used during cardiac catheterization and other cardiac imaging procedures. Several dose reduction strategies have been proposed and adapted in children who undergo cardiac catheterization.,,, Ability to measure radiation dose with accuracy is desirable so that the operators may use the dose information to make decisions during these procedures. The risk of radiation exposure to the human subject is two-fold. The first concern is absorbed dose to the skin, which can result in deterministic effects such as erythema, epilation, and in severe cases, necrosis. These effects occur more or less predictably when certain dose thresholds are reached., Since radiation machine output decreases as a function of decreasing patient body thickness, the smaller size of most pediatric patients usually places them at less risk for deterministic effects than the adult population. The second concern related to radiation exposure is the risk of stochastic effects, which is generally of more concern for pediatric patients. The primary stochastic risk is cancer induction, the risk of which depends on the radiation absorbed by radiosensitive organs and tissues in the body. Measurement of these doses is difficult. It is well-known that fluoroscopy time alone is a poor measure of radiation dose received by the patient. Various indirect estimates are available, including air kerma (AK) and dose-area product (DAP). AK is the more appropriate measure for estimation of skin dose. It is reported by fluoroscopic equipment as the absorbed dose in the air at a manufacturer-defined reference point, which may or may not correspond to the location of the patient's skin at beam entry. The International Electrotechnical Commission (IEC) defines the reference point as 15 cm from isocenter in the direction of the X-ray tube, although this standard has not been adopted by all manufacturers. While this reference point may be a reasonable estimate of the skin entrance location for an average-sized adult patient, this definition neglects to take into account other factors such as body-size variations between individuals, table attenuation, beam angle, backscatter from the patient, and conversion of AK to tissue kerma. In addition, the AK is usually reported as a cumulative value that does not take into account variations in tube position that may spread the dose among different skin sites, reducing the potential for deterministic effects. DAP is calculated by multiplying the AK by the beam area. It is independent of the distance from the tube to the patient, so no reference point is defined or needed. However, the DAP measurement does not allow the user to separate the influence of beam size and AK, and hence, it is not ideal for calculation of skin dose (A low AK and large beam area may produce the same DAP as a high AK and small beam area, although the latter scenario represents a larger risk of skin injury to the patient). DAP is most appropriate as a predictor of stochastic risk since it indicates the total amount of radiation delivered to the patient. Although AK and DAP both have limitations, they are currently available on most modern commercial fluoroscopy machines and provide useful real-time feedback to the operating physician. Some of the limitations of machine-reported AK and DAP can be overcome by the use of direct measurements at the patient skin surface. In both adult and pediatric populations, radiation exposure is often determined using thermoluminescence dosimeters (TLDs) affixed to the patient. An alternative method to measure radiation exposure is the use of optically stimulated luminescence (OSL) dosimetry. OSL dosimetry became commercially available recently and has the advantage over TLD because of easier processing compared to TLD, and the measurement can be repeated multiple times for consistency. With TLD, the measurement can be performed only once. When the film is heated, the trapped energy is discharged as the reading is done. The aim of this prospective study is to measure skin dose with OSL dosimeters and compare the results to conventional machine measurements of cumulative AK. This is a prospective observational study, performed as part of quality improvement initiative in the cardiac catheterization laboratory. Institutional review board approval was waived for the study and publication. nanoDot® (nanoDot®, Landauer Inc., Glenwood, IL, USA), an OSL dosimeter for single point radiation dose assessment was used in this study. NanoDot® is a flat, approximately 10 mm × 10 mm size, a plastic cassette that contains a film coated with Aluminum oxide doped carbon crystals (Al3O3:C) [Figure 1]. Nanodots are based on optically-stimulated luminescence (OSL) dosimetry as opposed to the more commonly-used thermo-luminescence dosimetry (TLD) method. Each Nanodot is prescreened by the manufacturer for variation in crystal sensitivity and adjusted to be within 2% between Nanodots and is supplied with a unique serial number and bar code. A total of four Nanodots, two per plane of fluoroscopy were secured in place using adhesive tape to the skin, with the barcode side of the Nanodot facing the patient. This pattern ensures that the side of the film with radiation-sensitive crystals is facing the X-ray tube. Thus, for the frontal plane, Nanodots was placed in the back of the patient, slightly to one side of the spine to avoid pressure-sores during the procedure. For lateral plane, the Nanodots were placed on the right chest (facing the X-ray tube) in midaxillary line, slightly below the axilla – usually in the 5th intercostal space at right midaxillary line [Figure 2]. Care was taken to avoid double exposure of each Nanodot in both image planes by appropriate placement and collimation of the field of view. Nanodot is not radiopaque. Therefore, double-exposure occurred in first two patient and was evident when the readings were available. From third patient onward, a custom-made radio-opaque thread was glued to the side of each Nanodot taking care not to interfere with X-ray beam reaching the sensitive area of the detector. In the early phase of the study, these radiopaque threads allowed us to identify the location of Nanodots and thus helped us to refine the appropriate positions for Nanodots that would prevent double exposure in all possible imaging planes. Nanodots were removed at the end of the catheterization procedure and sent to the onsite Landauer laboratory for reading on the same day to avoid latent dissipation, as described below. Nanodots were re-used after at least a 24-h exposure of the detector to bright light on a reflective mirror surface, after appropriate sterilization. Microstar® reader (Landauer Inc., Glenwood, IL, USA) is calibrated using a set of Nanodot controls supplied by the manufacturer in triplicate. These controls had been exposed to known doses at 80 kVp ranging from 0 to 1 Gray (0 to 100,000 mrads). Sensitivity correction factor unique to each Nanodot is identified by scanning the bar code and is entered into Microstar® reader software. Sensitivity correction factor for the Nanodots used in this study ranged from 0.05% to 0.85%. Nanodot readings are performed at least 30 min after the completion of the exposure, to allow for exposed crystals to reach steady state. Two Nanodots were used for each imaging plane; with each serving as a control for the other. Values of these two Nanodots were within 5% of each other. Because this is a new technology applied to a novel clinical situation, each Nanodot is read three times and the average and standard deviation were calculated. There was a high concordance among the 3 readings. It is of note that OSL technology allows for multiple readings on the same Nanodot unlike TLD where the film is discharged of its energy after one reading. The values of these two Nanodots for each plane were then averaged. The average values of Nanodots for PA and Lateral planes, respectively, were added and reported as Nanodot reading in this study. Demographics, body size, diagnosis, and type of procedure were obtained from catheterization laboratory log book. Cumulative AK readings were obtained from the fluoroscopy monitor display at the end of the procedure. AK values for PA and Lateral planes were added, and the total value is reported as cumulative AK. As per manufacturer's fact sheet, the AK reported is the value estimated at the interventional reference point (i.e., 15 cm below the isocenter of the X-ray beams, as required by IEC guidelines). Nanodot readings and cumulative AK values are reported as medians (and range). The scatter plot was constructed using Excel spreadsheet. Linear regression trend line and formula were derived to evaluate the correlation between the two values. The correlation coefficient was calculated using a best-fit trend line for the data. Sigmaplot® 13.0 software (Systat Software Inc., San Jose, CA, USA) was used. Fifteen patients were studied. Two were excluded secondary to the discrepancy in dose readings from double-exposure of the Nanodots when oblique views were used. A 22-year-old patient was removed because of adult age. Data from 12 patients were analyzed [Table 1]. Age ranged from 4 months to 18 years (median 1.1 years). Weight ranged from 5.2 kg to 86 kg (median 8.4 kg). Types of cardiac catheterization procedure included atrial septal defect closure (n = 4), right and left heart hemodynamic study with angiography (n = 2), balloon pulmonary valvuloplasty (n = 2), balloon angioplasty of coarctation (n = 2), PDA closure (n = 1), and coronary angiography (n = 1). Fluoroscopy time ranged from 3.3 min to 65.2 min (median 27.9 min). Total Nanodot readings ranged from 2.58 mGy to 424.8 mGy (median 84.1 mGy). Cumulative AK at the interventional reference point ranged from 16.2 mGy to 571.2 mGy (median 171.1 mGy). Excellent linear correlation (linear correlation formula y = 0.65x + 7.8) existed between cumulative AK values from the fluoroscopy display and Nanodot readings [Figure 3] with a correlation coefficient of R2 = 0.88 and R = 0.94. Based on Nanodot readings, skin doses of radiation for children were approximately 65% of cumulative AK displayed on the fluoroscopy display. Absolute values of Nanodot readings are approximately 65% of the cumulative AK at the interventional reference point reported by the fluoroscopy display. This difference is consistent with prior estimates expected between AK and actual skin dose  and is accounted for by several factors. Nanodot readings provide a direct measurement of skin dose received by the patient, irrespective of the size of the patient. This is important in pediatric cardiac catheterization because of the wide variation in patient body size and BSA. AK at the interventional reference point is established by IEC , at 15 cm from the isocenter, toward the X-ray tube. This “15 cm from the isocenter” was chosen because in an adult, it will correspond to the skin surface. For a 6 kg baby, approximate distance from isocenter to skin surface in the back is ~ 6 cm. Therefore, the 15 cm from the isocenter does not represent the skin surface, but will be somewhere in mid-air outside of the patient for a small child. Furthermore, AK measurements do not take angular beams, table attenuation, or backscatter from the patient into account. Cumulative AK values have an advantage of real time display during the procedure that can be followed by the operator; whereas, Nanodot readings are available only after completion of exposure and analysis in the laboratory after at least 30 min to allow for excited crystals in the Nanodots to reach steady state. Our findings are consistent with a prior study by Herron et al. Their study is focused on deriving a formula to calculate radiation dose in children during cardiac catheterization from fluoroscopy time, average cine mA and number of exposed frames. We analyzed parts of their published raw data to correlate Nanodot-derived values with manufacturer's display values for AK, and derived linear correlation formula (y = 0.57x + 70) and R2 = 0.84 that are consistent with our findings except for a higher intercept (70 compared to 7.8). Another Japanese study  performed in 15 children used radiophotoluminescence dosimeter chips applied to the chest wall during cardiac catheterization. Even though the similar correlation between chip readings and cumulative radiation dose (R = 0.82) and DAP (R = 0.78) were reported, absolute values in the report did not correlate as well as our study. The reasons may be secondary to the time interval between exposure and reading and lack of precautions against double-exposure of the dosimeters. There were certain practical difficulties in using Nanodots in this study. Nanodot is not radio-opaque; therefore, was subject to misplacement. In our initial test run, we had to exclude 2 patients in whom the values were concerning for either double-exposure of Nanodots to X-ray beams from both PA and lateral cameras or non-exposure of at least one of the two Nanodots (presumably, excluded in collimation). We overcame this issue by attaching a small radio-opaque thread to the Nanodots that were visible in fluoroscopy until we perfected the technique of Nanodot positioning. For PA camera, the Nanodots were placed in mid-interscapular area, close to the midline avoiding any possibility of pressure sores from long procedures. For the lateral camera, the Nanodots were placed in the mid-axillary line in mid-thorax [Figure 2]. Careful calibration of the Microstar® reader using controls that include the range of the expected radiation dose is necessary. Nanodots are re-usable, but there is an initial cost involved in setting up the system. Therefore, this is a method useful more for quality assurance study rather than a routine use in every patient. Important limitation of our study is the small sample size. A wider application of this technique across multiple centers will help to validate this technique and may be able to establish it as an important quality assurance tool, with the future possibility of making it standard of care if the cost can be minimized. Nanodots provide an alternative technique to directly measure fluoroscopic skin dose in children during cardiac catheterization. 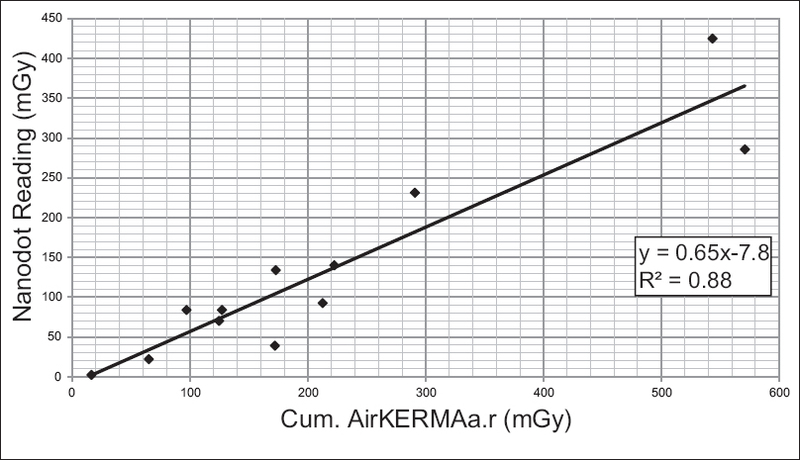 Our preliminary results show excellent correlation between cumulative AK and Nanodot readings. These data show that the actual skin dose in children is one-third less than the cumulative AK displayed by the manufacturer. Further technical refinement and confirmation of the correlation between established measurement techniques in a larger population with multiple subsets of patients of various body sizes will enable routine use of this technology in children undergoing cardiac catheterization. The authors would like to acknowledge Landauer Physics Inc., manufacturer of nanoDots used in this study and providing read-out of nanoDots without fee. NanoDot ® readings were performed by Mr. Matthew Rodriguez who is an employee of Landauer Medical Physics, Inc. Glenwood, IL at a facility located in radiotherapy department within our hospital where this study was conducted. Preliminary data from this study were presented at Annual Scientific Meeting of Society of Cardiovascular Angiography and Interventions, Las Vegas, NV in May 2014. This was conducted as part of Quality Improvement project, exempt by Institutional Review Board at University of Texas Houston Health Science Center. This is not a clinical trial and therefore, not registered. Linet MS, Kim KP, Rajaraman P. Children's exposure to diagnostic medical radiation and cancer risk: Epidemiologic and dosimetric considerations. Pediatr Radiol 2009;39 Suppl 1:s4-26. Wagner LK. Minimizing radiation injury and neoplastic effects during pediatric fluoroscopy: What should we know? Pediatr Radiol 2006;36 Suppl 2:141-5. Johnson JN, Hornik CP, Li JS, Benjamin DK Jr., Yoshizumi TT, Reiman RE, et al. Cumulative radiation exposure and cancer risk estimation in children with heart disease. Circulation 2014;130:161-7. Justino H. The ALARA concept in pediatric cardiac catheterization: Techniques and tactics for managing radiation dose. Pediatr Radiol 2006;36 Suppl 2:146-53. Verghese GR, McElhinney DB, Strauss KJ, Bergersen L. Characterization of radiation exposure and effect of a radiation monitoring policy in a large volume pediatric cardiac catheterization lab. Catheter Cardiovasc Interv 2012;79:294-301. Mauriello DA, Fetterly KA, Lennon RJ, Reeder GS, Taggart NW, Hagler DJ, et al. Radiation reduction in pediatric and adult congenital patients during cardiac catheterization. Catheter Cardiovasc Interv 2014;84:801-8. Sawdy JM, Kempton TM, Olshove V, Gocha M, Chisolm JL, Hill SL, et al. Use of a dose-dependent follow-up protocol and mechanisms to reduce patients and staff radiation exposure in congenital and structural interventions. Catheter Cardiovasc Interv 2011;78:136-42. Chambers CE. Radiation dose: It is more than just “time”. Catheter Cardiovasc Interv 2011;78:143-4. Balter S, Miller DL, Schueler BA. Radiation dose measurements and monitoring for fluoroscopically guided interventional procedures. J Am Coll Radiol 2012;9:595-7. Balter S. Methods for measuring fluoroscopic skin dose. Pediatr Radiol 2006;36 Suppl 2:136-40.
International Electrotechnical Commission. Medical Electrical Equipment – Part 2-43: Particular Requirements for the Safety of X-ray Equipment for Interventional Procedures. IEC Report 60601. Geneva: International Electotechnical Commission; 2000. Osborne DR, Yan S, Stuckey A, Pryer L, Richey T, Wall JS, et al. Characterization of X-ray dose in murine animals using microCT, a new low-dose detector and Nanodot dosimeters. PLoS One 2012;7:e49936. Herron B, Strain J, Fagan T, Wright L, Shockley H. X-ray dose from pediatric cardiac catheterization: A comparison of materials and methods for measurement or calculation. Pediatr Cardiol 2010;31:1157-61. Sun L, Mizuno Y, Iwamoto M, Goto T, Koguchi Y, Miyamoto Y, et al. Direct measurement of a patient's entrance skin dose during pediatric cardiac catheterization. J Radiat Res 2014;55:1122-30.